Although ubiquitous today, the classic cable knit sweater has a deep rich history, originating in the Aran Islands off the Irish coast. For hundreds of years it was worn primarily by fishermen and was known as the Aran sweater or the Fisherman sweater. The original Fisherman sweaters were made from undyed wool, hence the cream color, which I love. Today these sweaters are made all over the world, but the best and warmest ones are still made in Ireland. The simple but well-crafted knit, or rope-like pattern, and the raised texture is the definition of casual elegance. Throw your cable knit sweater over your shoulders for some added warmth and texture. 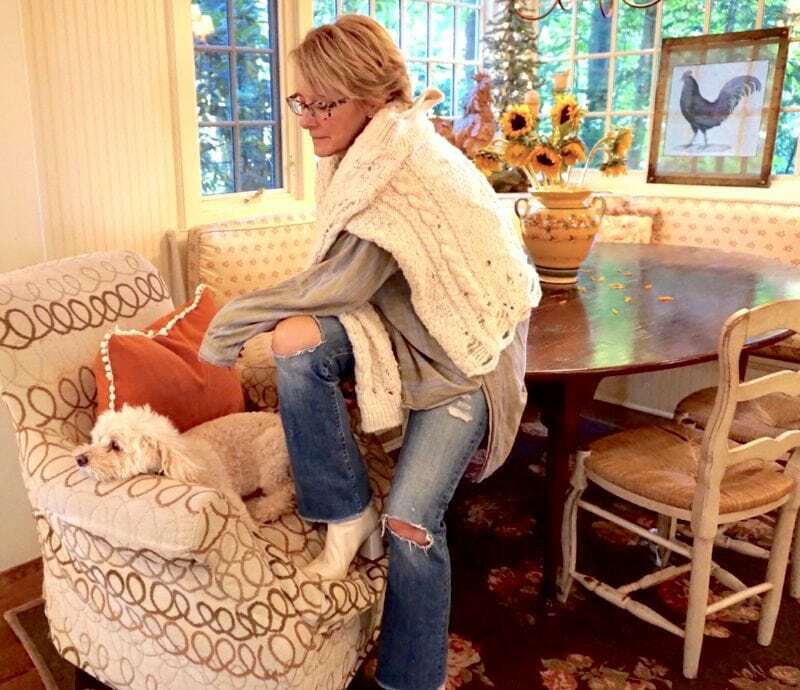 The cream sweater, booties and pooch :)) compliment the denim jeans and blue flannel shirt. Add a twist to the sweater and denim jeans combo by adding a pair of leopard pumps and a rugged messenger bag. Do you have a go-to winter look? 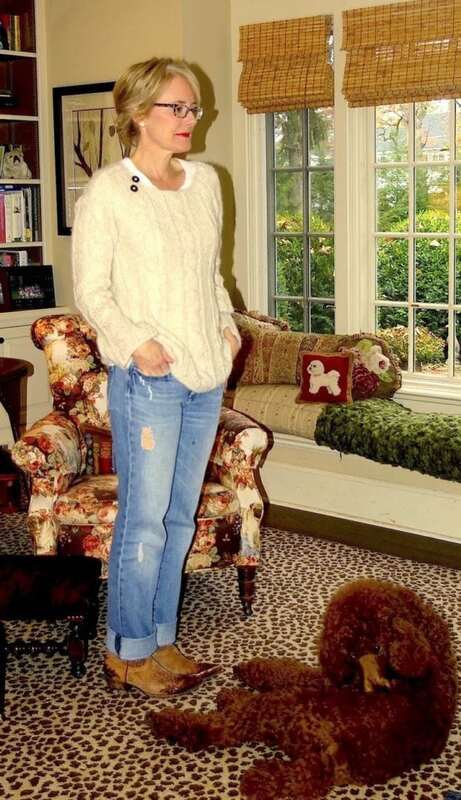 This is one of my favorites… a cable knit sweater over long sleeve t-shirt with jeans and cowboy boots. Throw a belt around your sweater. Because oversized sweaters tend to be boxy, I often belt them so it gives me a waist. How great does this sweater look paired with my wool blanket skirt, boots, saddle messenger bag and faux fur scarf? Add leopard print to your basic sweater and jeans like I did with my vintage, leopard muff handbag. Pair edgy with casual. The combination of a black leather skirt, black tights and boots and an oversized chunky sweater is unexpected but so stylish. A monochromatic look is always a style winner. I’ve paired corduroy pants with a cable knit sweater. To make the outfit more interesting I layered on a brown wool wrap and a vintage muff handbag. Layer over your sweater and throw a belt on to give your look shape. This vintage wool duster is the perfect over-the-sweater piece. The cable knit Fisherman sweater is that perfect “borrowed from the boys” piece. It can be dressed up, dressed down, layered and paired with just about anything – and that really comes in handy when you have to bundle up! What a treat, so many different style ideas with your wonderful collection of chunky knit sweaters! I love them all, thank you for the Style Nudge! Why thank you so much Helen, so glad you were nudged by this post! Thank you Rena, you can never go wrong wearing a cream colored, cable knit sweater! They really make the outfit don’t they? Thank you Liz! Love the mono look! Irish cables knits are super warm. Stay toasty! One of my favorites too, thank you Harare, you too! The wind chill is minus 6 today. I’m wearing sweat pants, a long sleeve tee shirt and a fleece vest. When I went out, I was wearing flat snow boots. In other words, I have no sense of style. To make it worse, I’m from Philly, a city renowned for it’s lack of well dressed people. My parents put very little emphasis on appearance. I never learned to shop or to put myself together. I’m not proud of this. It just is and at this point, I feel rather like an old dog incapable of learning new tricks. (BTW, our cockapoo, looks strikingly like your little white dog). Hi Suzanne, I think my doggie, Peanut is half cockapoo, we aren’t quite sure, he’s half poo something. As far as you feeling like you are an old dog incapable of learning new tricks, not at all. If you have a desire to dress differently you are never to old! In fact, I would argue that we are less inhibited as we age. Start small, you never know where it may take you. So glad you left a comment!! 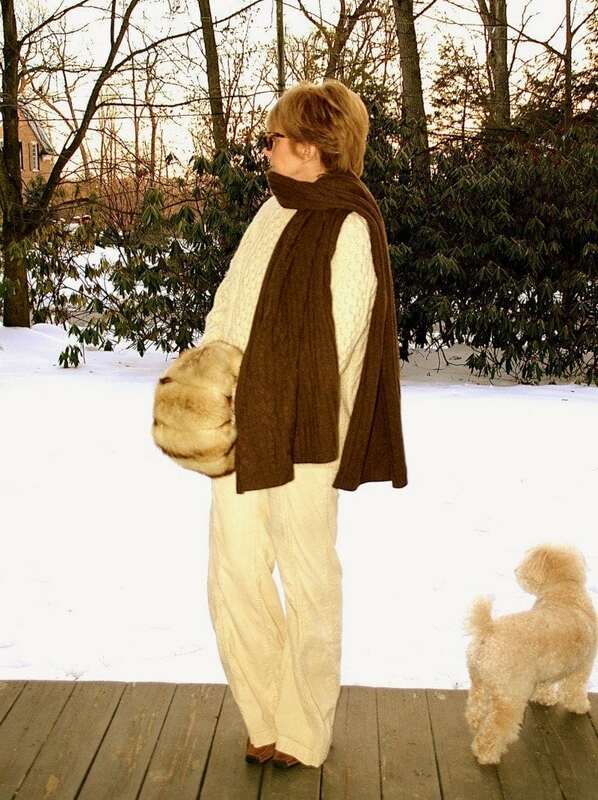 Cherie, these are perfect comfy winter looks! I love a big chunky sweater this time of year too. 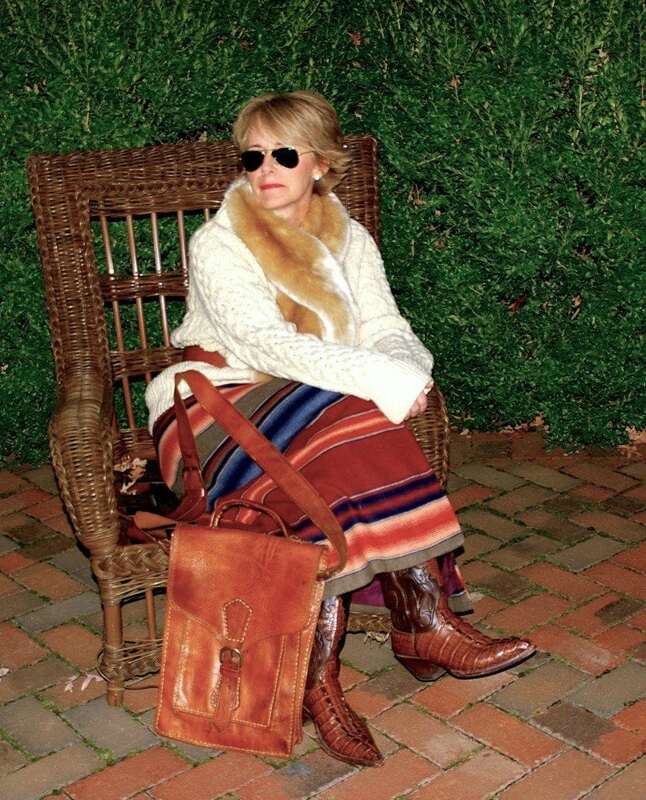 Love all your fabulous boots and especially that leather bag!! !